How Long Can You Stay in the US? Following on from our previous article Four Basic Facts About US Visas, we will now describe how to determine how long you are authorised to stay in the United States each time you enter on a US visa. As discussed in Four Basic Facts About US Visas, the validity period of your visa does not determine how long you may remain in the United States. Visas, which are issued by the US Department of State, give you the right to board transport and apply to an immigration officer at the port of entry for admittance into the US. It is however the US Department of Homeland Security (DHS), through its agencies the US Citizenship and Immigration Services (USCIS) and the Bureau of Customs and Border Protection (CBP), that determines how long you may stay in the country. [A]n alien whose B-1 visa may expire a month after entry into the United States could be admitted by a Department of Homeland Security (DHS) officer at a port of entry (POE) for a stay of up to one year. On the other hand, an alien whose B-1 visa has a validity of one year may be granted a stay of only one month, as may be determined by a DHS official at a port of entry. Every time you enter the US you should examine your passport carefully to determine the date on which your authorised period of stay in the US will end. This will be written in your passport by the CBP officer in the US airport or other port of entry. It is prudent to double-check this date after each entry to the US by obtaining a copy of your I-94 arrival/ departure record from the CBP website. If the date on your electronic I-94 record does not match the one written in your passport you may need to take action to reconcile the two dates, such as visiting one of CBP’s Deferred Inspection offices. In petition-based cases, such as H, L, O and P classifications, the situation can become even more complicated. When the USCIS approves a petition, it grants the classification for a certain period of time which is reflected in a very important document from the USCIS—the I-797 approval notice. However, the visa then issued by the Department of State based on the USCIS-approved petition may not be valid for the same period of time as that listed on the approval notice. In many cases, the USCIS approval notice is valid for a shorter period of time than the visa in your passport. If so, the USCIS-approved period—not the expiry date of your visa—will govern the length of your period of authorized stay in the US. For example, take the L visa. Pursuant to a 2013 change in Department of State policy most L visas for UK citizens are now valid for five years, regardless of the length of the underlying USCIS approval. However, the maximum length of a USCIS L-1 approval is three years, with extensions available. See DHS Regulations at 8 CFR 214.2(l)(7). In other words, the visa may be valid for five years even if the underlying approval is valid for only one year. This ‘disconnect’ between the approval period and the visa validity period is the reason that you must present your I-797 approval notice from the USCIS along with your visa at the US port of entry—to show that you are still within the period of petition validity. 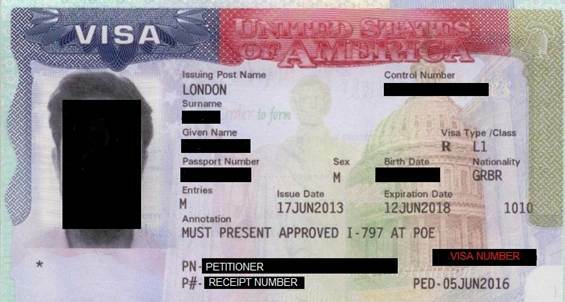 The petition validity is also noted on the visa as the PED (‘Petition Expiry Date’), which has the same expiry date as shown on your approval notice. The PED is in the lower right-hand corner of your visa. You can see this on the sample below. If you want to remain in the US in your visa classification past the PED, and you have not otherwise changed your status, for instance, to become a lawful permanent resident, a petition would need to be filed with the USCIS for an extension of stay—assuming that one is available for your classification. Although it can be confusing to have a visa that is valid for longer than the USCIS approval, there is a bright side: Once you have an approved extension petition from the USCIS, you do not need to leave the US to apply for a new visa from a US embassy or consulate. Instead, you can continue to travel on your old visa until it expires. You just need to remember to take your extension approval notice (your new I-797 approval notice) with you when you enter the US on your pre-existing valid visa. The PED on your visa will be superseded by the new approval notice and you may remain in the US until the expiry of your new I-797. Travelling on other visas that are not petition-based presents a different assortment of length-of-stay questions. For example, if you are admitted to the US on an E visa you can be given an authorised stay of up to two years, even if your visa is just days away from expiring. See DHS Regulations at 8 CFR 214.2(e)(19). Although we hope that this article and Four Basic Facts About US Visas have been helpful, no articles can cover all permutations of the facts. They should not be relied upon as a substitute for legal advice tailored to the specifics of your situation. If you believe that legal advice would be helpful you should consult a qualified US immigration attorney.